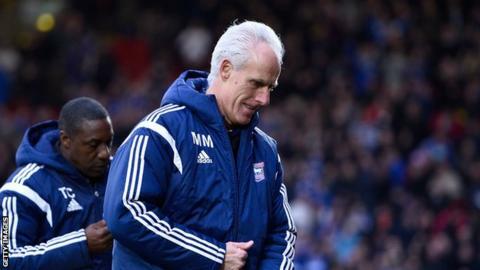 Ipswich Town manager Mick McCarthy says he is as disappointed as the club's fans by his side's recent results. Ipswich are four points from a play-off spot with eight games to play, starting with a trip to Wolves on Saturday. "Join the queue and get right to the back of it," McCarthy told BBC Radio Suffolk. "I'm at the front of it, I'm unhappy as well. "All I can say is I don't intentionally play like that and my players don't intentionally play like that." Ipswich began February in the top six but have since slipped down the table and lie eighth. The Tractor Boys pipped Wolves to the final play-off position last season on goal difference, but with Wolves well out of contention this year in 12th, McCarthy expressed sympathy for opposite number Kenny Jackett. "I remember going there and playing against Benik Afobe and Nouha Dicko at the end of last season and they were a real threat. Bakary Sako as well," said McCarthy, who managed Wolves between 2006 and 2012. "To lose those players, it makes your team worse. I feel for Kenny a bit. He's having a tough time but they are still a capable team."